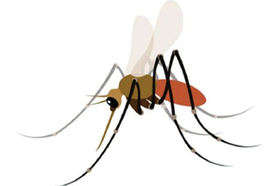 Two public healthcare workers in Maryland are itching to add a mosquito emoji to the online animal kingdom. The Baltimore Sun reported Marla Shaivitz and Jeff Chertak want to generate buzz for the emoji with a petition to the Unicode Consortium, the not-for-profit in charge of such characters. After all, ants, bees, beetles, butterflies, crickets, snails and spiders already have their own emojis. Even scorpions. The healthcare workers say the emoji could be used in communications campaigns and warnings by scientists and public health workers as they battle Zika, malaria, dengue fever and chikungunya. The emoji also could allow sickened individuals to identify themselves or warn others of an infested area. A few emojis are added annually to the stock. The consortium will pick new ones in October, adding to the current list of 2,666. More than 50 were added earlier this year, including images for vampires, mermaids and a human brain.